The ClamSeal repairs tears on inflatable boats and life rafts up to 3 1/2″ long, quickly and easily without the need for glues or drying time. Perfect to keep on board with your emergency equipment. Simply insert the base plate into the tear or split, draw the 2 faces of the ClamSeal together using the stopper ball and lanyard, engage the nut and tighten to form a clam-tight seal. 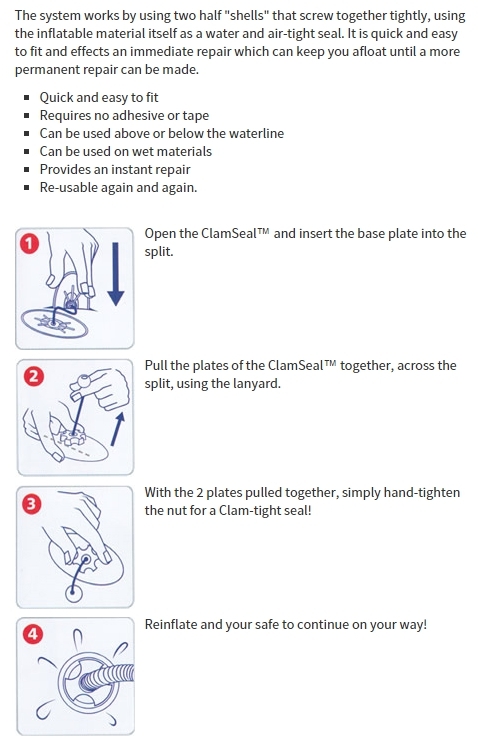 The ClamSeal can be used many times – simply unscrew the nut to release the seal. The ClamSeal will act as an effective seal indefinitely as the materials will not corrode. The unit measures 4″ by 2″. Hypalon Patches for Inflatable Boat Repair, 6, pre-sanded. Available in Light Gray, Dark Gray, Black, Red or White. Toobseal 8 oz Inflatable Mattress and Pool Toy Repair. Enough to only do one air chamber of an inflatable dinghy. Achilles Hypalon Seam Tape for Inflatable Boats, 57"